Background: Magnetic targeting, which utilizes a magnetic field to specifically deliver therapeutic agents to the targeted regions, can greatly improve the treatment efficiency. On the other hand, glucose-modified nanoparticles have also demonstrated good brain-targeting abilities. Fusion of both might further improve the brain targeting efficiency. Objective: To prepare, characterize and evaluate glucose-modified ibuprofen-loaded brain targeting magnetic nanoparticles (MNPs-APS-Glu). 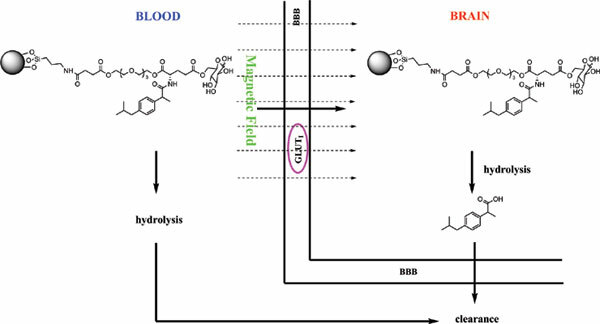 Methods: The magnetic nanoparticles MNPs-APS-Glu were designed and synthesized in order to effectively deliver ibuprofen to the brain through glucose transporter 1 (GLUT1) and an external magnetic field. The nanoparticles were characterized by FTIR, SEM and magnetic properties, and the drug loading capacity, cell cytotoxicity and drug release behavior of the new magnetic nanoparticles was studied. Results: The size of MNPs-APS-Glu was about 104.9 nm, and its drug loading capacity was up to 5%. Furthermore, these brain targeting magnetic nanoparticles maintained the magnetic property with a saturation magnetization level at ca. 32 emu/g and could release ibuprofen when incubated with various buffers, mice plasma and brain homogenate. Conclusions: The results indicated that the magnetic nanoparticles had potential to be a promising tool to selectively deliver drugs to the brain. This study may be conducive to the field of Central Nervous System (CNS) drugs delivery. Keywords: Brain targeting, Magnetic nanoparticles, Ibuprofen, Fe3O4, CNS, incubation. Keywords:Brain targeting, Magnetic nanoparticles, Ibuprofen, Fe3O4, CNS, incubation. Abstract:Background: Magnetic targeting, which utilizes a magnetic field to specifically deliver therapeutic agents to the targeted regions, can greatly improve the treatment efficiency. On the other hand, glucose-modified nanoparticles have also demonstrated good brain-targeting abilities. Fusion of both might further improve the brain targeting efficiency.